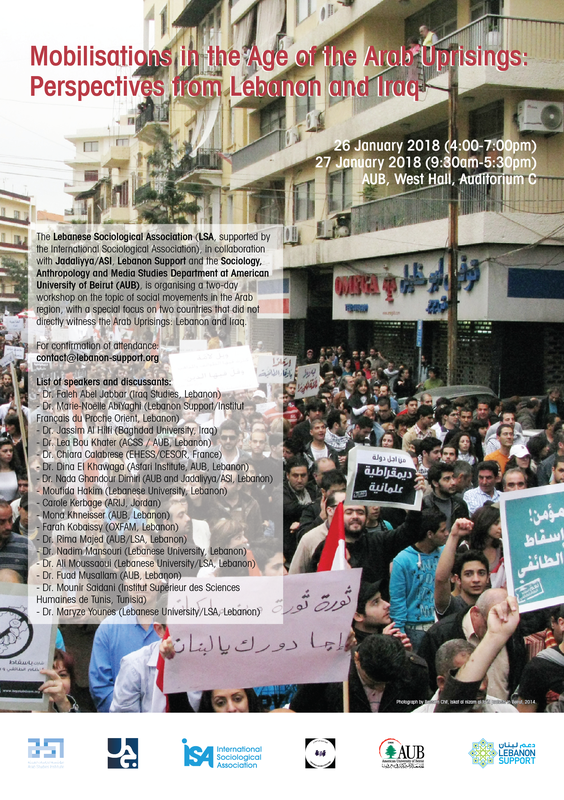 The Lebanese Sociological Association (LSA, supported by the International Sociological Association), in collaboration with Jadaliyya/ASI, Lebanon Support, and the Sociology, Anthropology and Media Studies Department at American University of Beirut (AUB), is organising a two-day workshop on the topic of social movements in the Arab region, with a special focus on two countries that did not directly witness the Arab Uprisings: Lebanon and Iraq. While the literature on social movements in the Arab region has witnessed a surge since the “Arab uprisings”, little attention has been given to countries in the region that have not directly witnessed those uprisings but that have been deeply affected by this revolutionary wave that swept through the region in 2011. This workshop proposes to conceptually and methodologically revisit the study of social movements in the Arab region, while shedding special light on the effect of the Arab uprisings on the dynamics of contention across the region. Lebanon and Iraq are two countries that specifically stand out in the region given their remarkable similarities in terms of social and political dynamics (sectarianised societies, post-war context, etc.) and the important effect of the Arab uprisings on their repertoire of contention since 2011. While most of the literature on those two countries is mainly focused on war, violence, sectarianism and terrorism; little studies have looked at social mobilisations and the dynamics of contention from below. Both Lebanon and Iraq have witnessed two main waves of mobilisation post-2011: the first in 2011 and the second in 2015. The workshop will aim at exploring the dynamics of contention in the Arab region since 2011 and will bring together a small group of researchers interested in the question of contemporary social movements and mobilisations in the Arab region.